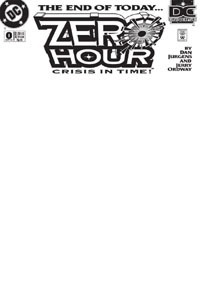 I recently (finally) finished covering the entirety of the Zero Hour: Crisis in Time event…DC‘s 1994 event/crossover. While my posts spanned July, August, and September 2016, I’m endeavoring to have several points in this blog to gather them together and keep them accessible. This is one such post. Below is a "grid" of the covers, linking to the Page indexing this. Below the grid are text links to the individual posts (same as indexed). This particular story basically sees a despondent, defeated Jean-Paul Valley momentarily existing as a homeless man on the streets. He’s been stripped of his role as Batman, having abdicated his role as Azrael for that, and now hasn’t a clue what to do with himself. 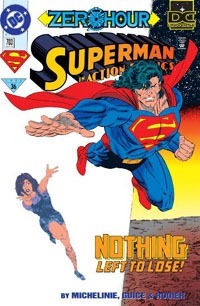 He contemplates himself, his life, where he is, what he’s been through, how his life has changed in a year (basically saying that from Sword of Azrael to Zero Hour has been about a year in the Bat-side of things–further backed by the Superman: The Man of Steel issue where Batman mentions to Superman both having quite a year). Valley intrudes on a group of homeless, "hogging the fire," and eventually one is brave enough to approach him and engage him (albeit one-sidedly…or so it seems). When he up and leaves, the remaining homeless crowd around the fire and then are threatened by another group. Valley returns and drives them off, and continues to mope about, though now accepting that he IS a person, like any of these others. Story-wise, this seems both a sort of quasi-epilogue to KnightsEnd, partly following up on that and bridging that story and the start of the ongoing Azrael series that started sometime later in 1994, I believe. This is definitely where a title like this–Showcase ‘__–excels. You don’t have to have an entire issue of some other title dedicated to a story, but you can have a standard-issue-length story presented once without having to be entirely its own one-shot or Special Issue or whatever. There’s room for this Azrael (Jean-Paul Valley) story, prior to/without an Azrael title (yet), but without hijacking another issue of Batman or Detective or Robin or Catwoman or whatever. Given that, I like this story, and somehow was kinda surprised that it DID run the "full length" of a standard-sized issue. Then, for only 45 cents more (1994 pricing) we get another issue-or-so’s worth of content spotlighting other stuff. 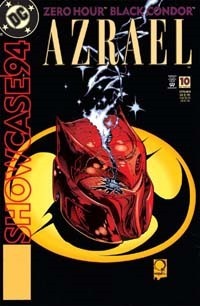 And the cover–featuring Azrael–is a nice Quesada/Kesel piece with the destroyed Az-Bats helmet on the Az-Bats-period Bat-symbol. Iconic, simple, and applicable to the story. I’d swear I’ve read stuff with Black Condor before–specifically in Justice League America–but this did not feel like that at all. I think it’s safe to say this is the first "solo outing" I’ve read of the character, and it felt like a bit of a first-issue thing, introducing the main character, a supporting character, and a conflict. 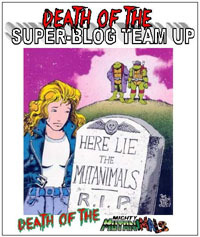 Of course, the hero starts to seem victorious, before being presented with a greater challenge, and we’re left with a cliffhanger (I ought to see if I have the next issue of this, but honestly I doubt I’ll get to it anytime soon…I’m interested, but not necessarily enough to hunt it down for an immediate read. Chances are if I ever get around to assembling the several years of these Showcase Years I’ll read it someday). The story and art are both good, and as mentioned above for the Azrael story, this is a solid outing that seems like it could lead into an ongoing series; but barring that/prior to that, serves in that stead, being allowed to be put out there as part of an anthology ongoing even where any singular character/story would not support its own thing. No real complaints, and I do feel I’ve a bit more insight into the character, or at least the context, than I would have had without having read this. 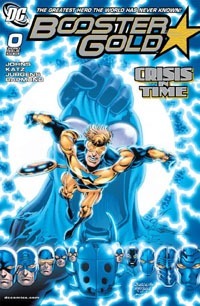 This story was all over the place, but essentially focuses on a group of Time-themed villains including Clock-King (I believe) and Calendar Man (I think–and not at all like the revamped Rebirth version!). The group is trying to steal some helmet or armor, and stuck in a time-loop, and they got confused in-story right after I got confused reading and jumping to the conclusion that there was some significant editorial error before realizing that was part of the story. And before things are completely sorted out, the story fades to white, signifying the "join" to Zero Hour. Visually, no great issue on this story for me…it’s not bad, not wonderful. I’m not overly familiar with the characters, don’t really care about them, and this story doesn’t seem to directly come out of anything…it’s just "a story set during _______" (here, Zero Hour). This tie is enough to "justify" including this in reading Zero Hour stuff, but the issue does not sport the official Zero Hour banner or trade dress. Of course, that’s in keeping to the title‘s trade dress of generic fonts for "logos" rather than some bold solo-title logo. At least it’s more tie-in than a number of tie-ins had, so it’s worth reading for the sake of completeness, though does not ultimately "matter." While this title itself–Showcase ’94–may not in and of itself matter all that much, I’m more convinced than ever at its greatness for its time. That’s not to say I could see following such a book long-term in the present, in 2016…but going back 22 years and the three issues I’ve now read for their having a segment each tied to Zero Hour, I recognize what the book’s existence allowed to be published without hijacking other books’ pages or the stories just not getting told. Add to that my not recognizing many of the creators and a slight memory suggesting this: the book was the sort for giving "new talent" a chance without being otherwise committed to a book. Try a writer out, give an artist a story to do, without compromising a "regular" or "ongoing" title, but still get their work out there, see how they do with various characters and creative team lineups. This issue as a whole is not worth it in terms of Zero Hour, really…but it’s a strong issue, with a distinctive cover, and for the quasi-self-contained Azrael story, it’s well worth a bargain-bin buy (just not worth some collector’s premium or markup despite the issue’s age or cover). I was looking forward to getting to this issue, as I only vaguely recall owning (and presumably reading) the first issue, and the two KnightsEnd tie-in issues. This would be the first issue of this iteration of Catwoman that I’ve read in years, and after not caring for New 52 stuff, I figured it’d be interesting and a bit refreshing to see the "classic" ’90s costume, etc. But then very shortly into the issue, I got sidetracked at catching a couple errors that I feel should have been caught in editing, that put me off a bit and dropped this a few notches in my esteem. The story itself is ok, but by the end of the issue, I felt like I’d missed something somewhere, as even being unfamiliar with this version of Catwoman, stuff still seemed a bit outta-nowhere to me. Catwoman completes a new heist–stealing some sort of ornamental/antique bed dedicated to Bast, a cat goddess. She sleeps, and when she wakes, she’s in the middle of Zero Hour (though those words are not used and there’s no telling she has any hint of that story going on). The city’s gone feral–or prehistoric–and instead of her tame house-cats, she’s got a sabre-toothed tiger as a pet; instead of a butler she’s got a barbarian in her place, and…yeah. Making the best of the situation–and the excuse to don her outfit indoors–Catwoman leaps into action. She and her new barbarian friend find themselves trying to save the prehistoric cat from a hunting party, and then out of nowhere, Selina grabs the guy for a kiss, and the world goes white. I can appreciate the adventurous hijinks of having Catwoman team up with time-displaced stand-ins for Marvel‘s Ka-Zar and Zabu, and definitely like that–by way of acknowledging this title’s place in the event–we see Selina viewing multiple versions of herself in a multi-panel mirror and all. And in a way, this having virtually zero context for me–it does not seem continued FROM the previous issue, and other than the fade-to-white signifying the end of Zero Hour #1, this doesn’t seem likely to necessarily CONTINUE to the next issue (but what do I know, having never read the #0 or #15-onward?). So on one hand it’s a "fun" sort of stand-alone/one-off story. Establish Selina/Catwoman. Change the environment, introduce shirtless-guy and ancient kitty, move into cliché story of pet wild animal being hunted. Sure. Then the kiss and…that’s it. So despite "fun" randomness, I’m just NOT *impressed* by this issue. Visually, the art is good…though I may be biased (particularly recalling back to my 13-year-old self)…this is a book that I’d simultaneously say we wouldn’t get "today" and yet in some ways, I think we WOULD with a certain on-page sexiness and suggestion being more acceptable nowadays than 20-some years ago. 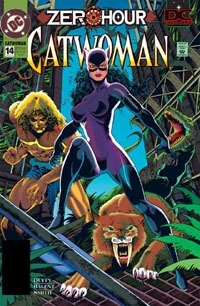 And at least in retrospect, I realize that where I’ve often prided myself on having AVOIDED the "bad girl comics" until last year’s Aliens/Vampirella…I think I had a brush with them in this ’90s Catwoman title. That said, this issue is certainly no necessity for the reading of Zero Hour itself…but it’s a fun-ish one-off. It does somewhat walk a thin line of being somehow gratuitous with that skin-tight costume leaving nothing to the imagination and yet being fairly acceptable for what it is (hey, at least she’s covered and not showing bare skin all over–it’s a Code-approved comic, after all!). I don’t recommend the issue in and of itself–it’s not something to track down. But as with so many of these tie-in issues…if you’re working on a run of the series, or this event, etc. it’s not necessarily something to AVOID. The issue’d be worth 25-50 cents or so, but not something I’d pay cover price for, and maybe not even something I’d pay $1 for. Still, having read it, it has me curious about the series itself and thinking if I found a run of the series in the cheap-bins, I’d be inclined to snag ’em.